It took far longer to set these cookies up for pictures than it did to make the simple cookie dough. So if you stocked up on some good butter for the holidays and still have some sitting around in your refrigerator, this is a good way to put it to use. I had my heart set of using Danish Lurpak butter for this recipe; I had seen it at Whole Foods last holiday season and assumed it'd be there again this year. I was wrong and there has been no Lurpak in sight. Instead, I used Plugra butter for this recipe. The dough is fairly firm so be prepared to give your piping bag a steady, firm press for even distribution. My skills are sorely lacking so my cookies are not the prettiest (far from pretty) but if your family is like mine, they're not inspecting them too closely for critique. After piping the cookies into whatever shapes you want, bake them until they are just lightly golden around the edges and the back while the center is fairly pale. Here's an example of how the back of my cookies look. The best part is definitely picking up one of these cookies and eating it. They crumble under your teeth, giving you that expected crunch. Then, you begin to taste that familiar buttery sweetness swirled together with vanilla and a touch of salt. And surprisingly, it breaks apart and seems to kind of melt away in your mouth. That's pretty sensational for a cookie made with just 6 simple ingredients. I hope you've been enjoying the holiday season, savoring treats and soaking up plenty of festivities! Enjoy the rest of December and have a very joyful holiday! Preheat the oven to 350 degrees, positioning racks to divide oven into thirds. Line 2 baking sheets with parchment paper or silicon baking mats. Place butter into the bowl of a stand mixer fitted with the paddle attachment. Sift confectioners' sugar over top and add the salt. On low speed, beat until just smooth (not fluffy). You're aiming for a smooth dough but not looking to beat air into it. Beat in the egg white. The dough will turn slick and separate but will smooth out once the flour is added. Beat in the vanilla and scrape down the bowl. Gradually add the flour, beating only until it disappears into the soft dough. Do not over-mix. Fit a pastry bag with an open-star tip that's a scant 1/2 inch in diameter (I used Ateco #864). Scrape the dough into the piping bag. (You can also pipe plain cookies by filling the dough into a zip-lock bag and snipping off a corner of the bag). Pipe the dough onto the prepared baking sheets. You can make traditional "W" shapes that are about 2 inches wide and 1 1/2 inches high or pipe any size/shapes you prefer. Be sure to leave about 2 inches of space between the cookies to allow room for them to puff and spread during baking. Bake cookies for about 17 to 20 minutes, rotating the baking sheets midway. The cookies should be golden brown in the edges and on their bottoms and paler in the center. Allow cookies to cool on baking sheets a few minutes before transferring onto cooling racks to cool to room temperature. You can store the cookies in an airtight container, at room temperature, for at least 1 week. They can also be frozen for up to 2 months. Oh Monica, I'm so happy to hear that you got to make so many of your favorite cookies and can enjoy some family time with your family during the holidays. We are winding down over here too and I am looking forward to spending some quality family time too :) I love these viennese sables you made, they look so pretty and there's nothing like a crisp buttery cookie when you are craving some sweets :) Hope you and your family have a wonderful holiday season and a very Merry Christmas in case you are not around next week. They look so pretty and melt-in-mouth! Love those golden star sprinkles. Thank you, Angie. Merry Christmas and a very Happy New Year! I'd love to try these cookies. I love butter cookies! These cookies remind me alot of the ones we ate as kids, they had that crinkly design and just melted in our mouth. I am wishing had one right now, yum! Monica these cookies look so decadent and rich and yes I do love that crispy buttery cookie. How cute are those little edible gold stars. I am having a problem at my house in the cookie making saga. I make them and as fast as I can my boys are eating them. Seriously, we have a problem as we might not have any left for Christmas day. Need to get a lock for the freezer door.... Wishing you and your family a safe and happy holiday. Just shared! haha! I love cooking for boys with healthy appetites! I know you have that pleasure. : ) Hope you double-up your cooking and everyone indulges well on Christmas day. Thank you for all your kind words throughout the year! Happy Holidays! 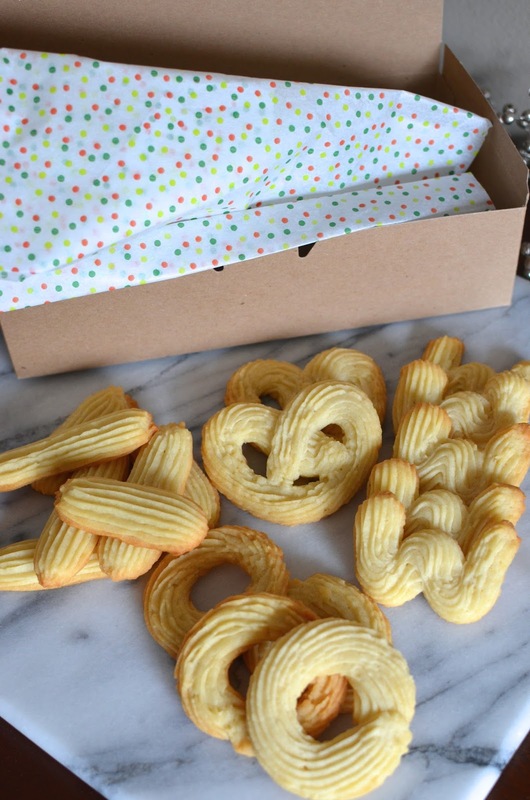 As a Danish butter cookie addict, I need to try these!! I love how you even shaped them like some of those cookies. "Tried" to shape them is more like it...thank you, Joanne. Those Danish butter biscuits are so good! I'm happy this mimics them so well. My grandma used to always buy the tins of these cookies - I'll have to bookmark these for next year! We're winding down here too with all the baking. Merry christmas!! I didn't grow up eating many sweets (except for chocolate) and there was no baking at my house but I remember those blue tins. I loved it! I think there was a huge budding sweet tooth inside me waiting to be unleashed. ; ) Merry Christmas to you! Enjoy!! Hi Consuelo! How are you! Thanks so much - glad you like it. I needed a little makeover - better late than never, hopefully. Thanks for stopping by. Hope you have a nice holiday break and get to eat lots of delicious cookies and treats! These look "melt in your mouth delicious!" How lovely. You will have a wonderful array of cookies to share on Christmas. I made the almond scones and loved them! Merry Christmas to you and your family Monica! Wow, these cookies sound simply amazing! Anything that melts in your mouth like that and has that kind of texture and taste must be delicious. Dorie's recipes are all fantastic! (: Happy holidays to you and your family, Monica! Sounds great! Happy Holidays to you and yours! Oh my gosh!, these look so pretty and love the way you piped and decorated. I wish you and your family fun filled holidays! Same to you! Thank you! These sound so rich and buttery! Amazing!!! I sure enjoyed eating 'em. Thanks! I am glad that you were able to make and share so many wonderful cookie recipes. I just didn't get to make that many this time and not even posted a single one. The cake and dessert posts took over and we just received too many cookie presents this year. I don't want to let go of December either Monica but also very curious to take a peek into what the New Year holds for me. Beautiful cookies like all the others! Your cakes and desserts more than made up for cookies - they were show stoppers! Here's to a wonderful New Year filled with happiness and beautiful food! Thanks so much, Jo. Glad you approve. Hope you had a wonderful Christmas. Happy New Year! Monica these little cookies look fantastic! I like the sound of the texture of these. We only made one type of cookie this year and already I'm wishing I had made more! :P Merry Christmas!! The texture is really special. Hope you had a great Christmas! Your cookies look wonderful. And what a great early Christmas gift! Hope you're having a very merry Christmas day. Same to you, Beth. Happy New Year! Hi Monica, these cookies look wonderful, great idea to make a few batches and then freeze them for the holidays, will try that method next year. Happy Holidays to you! Cheri, I didn't discovered the magic of the freezer until recently and it's changed my life a bit. : ) A lot of cookies hold up so well in the freezer - these and sugar cookies are great frozen after they've been baked. Hope you are having a lovely holiday break!